I have to admit, I am not generally a fan of nautical adventures. 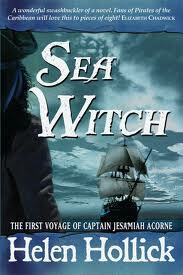 I have never particularly desired to read, for example, Patrick O’Brian’s Master and Commander or Julian Stockwin’s Kydd adventures series (but did, come to think of it, enjoy Robert Louis Stevenson’s Kidnapped, hmm…), so I was a rather skeptical of my ability to become engrossed in Sea Witch. However, knowing the author is a writer of enjoyable historical fiction, I was open to giving this a try. In all honesty, I have to say this is the best Indie book I’ve read to date. In fact, this is one of the best novels I have read in a very long time. Everything that an avid reader and reviewer looks for in a novel is here: strong character development, multidimensional portrayal (one of the biggest strengths of the book), a superbly plotted story with excellent tempo and a tight narrative, gripping and fluid language, vivid description, and tension and release at just the right moments. This is a pirate adventure with wide appeal; there is something for everyone. I have been skittish about nautical adventures because to me, the subject seems geared toward masculine tastes (and having not read many, I could be completely wrong about that!). Here, we have a pirate who is internally tormented and struggling with a sense of vulnerability; a character who may appeal to a more emotional sensibility. On the other hand, our hero is not “soft”; he is a hardened pirate through-and-through, who takes pride in his work and is very good at it. He is a complex man, fighting his past, making the most of his present circumstances, and trying to avoid terrible possibilities that lurk in the future. He gets into scrapes and makes quite human mistakes: a multidimensional rogue of sorts. A deeply moving, but not overly sentimental, love story is also well done in Sea Witch. Tiola Oldstagh herself has been injured deeply and is the one woman who could possibly break down Jesamiah’s tough barrier. The two must exercise extraordinary patience and faith during times of great despair, and we don’t know until the conclusion if they will make it—the punches keep on coming at the end, one after the other after the other, and I couldn’t sleep until I turned the final page. The details of the ship’s workings, the descriptions of the crew’s behavior and pirate culture throughout the book are impressive. The author has a tight grasp on nautical details (the parts of a ship, sailors’ language, the lifestyle—as far as a novice such as I can tell) and a way of writing about them that makes this book an entertaining education on top of all else. My favorite aspect of the story, and one of the reasons, I’ve heard, that this book was rejected by mainstream publishers, is the mystical, supernatural element. The subtle, overarching theme is the epic battle for Jesamiah’s body and soul between the living, immortal “soul of the sea, spirit of the waves” Tethys and Tiola, the young healer, Jesamiah’s soul mate, who turns out to be a “White Witch,” who uses her power of “The Craft” only for good. This epic battle is a powerful element of the story. It adds a depth and a spiritual texture that is beautiful and convincing, even carrying over to the terrifying aspects of Tethys herself. There is much veneration of nature, of beauty, and of the unknowable in this theme. Let yourself float off into this element of the story, without judgment or skepticism, and your enjoyment of the book will only increase. How interesting to read the opinion of a rather self-indulgent traveler of the sea about a future classic of literature when it was just a thought in the author’s mind! This is the kind of intelligent detail you will find in this novel. The author has included a map, an illustration of a square-rigged ship with parts identified, as well as a glossary of seafaring terms at the back of the book, so readers can follow along with the “sailor-speak” (which, gratefully, does not interfere with the reading flow). My criticisms are miniscule compared with the overall quality of this book: more than a few typos and missing words; perhaps the dependent clause-technique was overused a bit too much for the comfort of my editorially trained ear; and a cover that is a little dark for my personal taste, but does describe the atmosphere of the book. Overall, the publication is professionally laid out and pleasing to look at. Shame on mainstream publishers for rejecting a book of this quality. Historical fiction with an infusion of fantasy is not an uncommon or unpleasant combination in a novel! I think Sea Witch would sell quite well if it were to be aggressively marketed. This is the work of a professional, experienced author, not a novice. I absolutely loved Sea Witch and highly recommend it whether you are a fan of pirating/seafaring adventures or not—and I will be reading the next book in the series as soon as I can get my hands on it! Sea Witch, by Helen Hollick. Published by Silverwood Books, 2011. ISBN: 9781906236601. Price US paperback $18.50, Kindle edition $3.99; UK paperback £10.99, UK Kindle edition £3.20. DISCLAIMER: The author and I work on the HNS Indie Reviews team together, however, this review is an unbiased opinion piece of my own, with no influence from the author. She sent me a published copy of this novel for an independent review. Oh my goodness! What a lovely thing to find on a Sunday morning on holiday! I didn’t have internet access yesterday & anyway I was out and about enjoying the beautiful Devon countryside & doing some research for the 4th Sea Witch Voyage…. opened my e-mail up today – & found Andrea’s awesome review. I actually don’t know what to say I am so thrilled! I loved writing Sea Witch – I felt as though I too was on an adventure, and many of the scenes just wrote themselves. I couldn’t stop writing it – even over the Christmas of that year the words poured out of me. I can’t believe it still has typos! ::-/ It has been edited several times – where do these gremlins hide during an edit? Only to re-appear on printing? Hey ho – another edit…. sigh. I fully endorse the review.